While something of a master when it comes to art-house shock value, filmmaker Michael Haneke softens his usual death blow with "The White Ribbon." 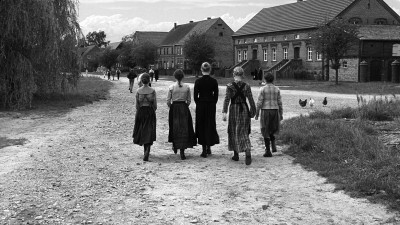 A substantial tale of deception, accusation, and oppression facing a pre-WWI North German village, the picture moves steadily along in a grand act of exposure, guided by Haneke's finest instincts for confrontation and chilling acts of invasion. It isn't quite the shiv of cold-blooded reality the director is known for, but more of a fractured memory piece, with forbidding shards of destructive behavior jutting out of the most unexpected of places. When a local doctor is tripped by a hidden wire while riding his horse, leading to an extended hospital stay, it triggers a series of sadistic events that shake a remote German village to its core. The alarm is recalled by a local School Teacher (Christian Friedel), who observed his community fall apart over the course of a few years, watching as the men in charge, be it through medicine, education, or religion, ruled the village with an iron fist, while a poison of discontent and abuse spread into every dwelling. As the acts of spitefulness mount from mysterious sources, the village is brought to a standstill while the promise of war looms on the horizon. Shot in black and white and given the proper Haneke-approved cinematographic distance, "White Ribbon" is a stunning document of religious and economic oppression. Though emotively narrated by The School Teacher, the filmmaker bloodlessly details the horrific events of the village, stitching together a portrait of discontent muffled ruthlessly by repression and the threat of community exclusion. Neatly unfolded and tightly bound, "White Ribbon" controls like a novel that can't be put down, generously introducing fresh areas of disease, violence, and suspicion that winds the tension to almost polite explosions of revelation. Again, it's not Haneke's most volatile charge of direction, but a superbly throttled odyssey of contempt and disgust that draws in the viewer with startling composure. "White Ribbon" is broken down into stories of imploding households, and how they make up the unsettled village temperament. What starts with a brutal stroke of revenge on the local doctor (a man of uncertain perversion) soon creeps into the diverse domiciles, where a viper's nest of secrets and shame is fiercely guarded from the outside world. "White Ribbon" uses the string of violent acts as a narrative path to remain on, but the meat of the matter is found behind these closed doors, observing how religion and abuse contort the curious mind, breeding further hatred and violence for future psychological detonation. The film is told statically, but the images of discipline and violation are simply unforgettable, building patiently as the delicate mood in the village grows bleaker and profoundly more paranoid by the month. Haneke's nihilism doesn't get the best of him here, and there's some sunshine offered in the year-long courtship between the School Teacher and a virginal, teenaged nanny. The subplot also widens and encourages the humanity of the community, dropping a few notes of tenderness before plunging back into the unavoidable darkness. Explored through an unreliable narrator to further thicken the mystery of motive, "The White Ribbon" captures a shell-shocked ambiance that's pruned to near perfection by Haneke, who presses on the senses with masterful control. The film is a world-class tome of horrors, with each page turn revealing another act of behavioral madness that could be dissected and debated a thousand different ways. Buy tickets to "The White Ribbon" now!